Naturally Thin: Unleash Your Skinnygirl and Free Yourself from a Lifetime of Dieting was written by Bethenny Frankel, who is best known for her appearance in the reality television program, The Real Housewives of New York City. 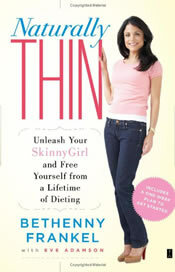 Frankel says that Naturally Thin is not a diet book because diets don’t work. Her goal is to free you from obsessing about diets and to give you the freedom to eat whatever you like, just not too much of it. She says that this is the key to letting go of guilt and developing a healthy relationship with food. Even though Frankel does not recommend dieting she does say that you need a set of guidelines in order to achieve weight loss success. Your diet is like a bank account. You need to balance your daily calories. You can eat anything you like, just not all at once. Taste everything; eat nothing (share food and take small bites). Don’t eat everything on your plate. Divide one meal into several smaller meals. Stop emotional and binge eating. Make peace with food. Don’t obsess about being thin. Breaking the rules is allowed occasionally so long as you get right back on the program. The main thing is to avoid obsessing about being perfect and not to allow yourself to experience guilt. Frankel advises dieters to eat unprocessed and organic foods as much as possible. She advocates a mostly vegetarian diet with a high intake of raw foods. Throughout the book Frankel offers many helpful hints. For example, you can flush excess water out of your system when you are feeling bloated by eating foods such as melon, asparagus, cucumber, celery and apple cider vinegar. She also reveals some of the diet secrets of celebrities and shows dieters how to limit calorie intake at restaurants while still enjoying the taste of all of the dishes. Low calorie vegetables, fresh fruit, whole grains, lean proteins. Look for more healthy low Calorie meal ideas here. Frankel encourages regular exercise however she cautions dieters about over-exercising because this can be counterproductive and is often related with obsessive dieting. She says that you should be involved in physical activities that you enjoy such as walking or yoga and don’t worry if you miss your workout for a day or two. Naturally Thin: Unleash Your Skinnygirl and Free Yourself from a Lifetime of Dieting retails at $16. Includes over 30 recipes (including Frankel’s famous SkinnyGirl Margarita). Calorie and nutrient intake may be inadequate especially for physically active dieters. Portions in the meal plan will be too small for the majority of dieters. Some of the sample menus condone skipping meals and consuming too much alcohol. Many of the tips may trigger eating disordered behaviors. Does not provide a clear structure in regards to meal planning. Although Naturally Thin can help dieters to gain an awareness of portion control, many of the tips and recommendations do not promote a healthy or balanced approach to weight management. By implementing the advice in this plan dieters may achieve successful weight loss. However, for the majority of dieters it will be difficult to sustain such a low calorie plan over the long term.